I have a frightful amount of work to do this weekend (yes Jeffrey, I will finish that intro!) 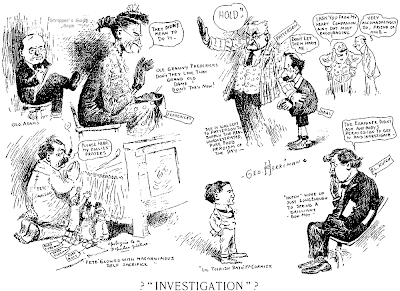 so just two cartoons today; March 12 and 14 1907. Enjoy! Regular blog readers know that I've been bemoaning the disappearance of Gordon Campbell's incredible vast collection of early tearsheets and original art. He'd talked to me shortly before his death and said he still hadn't made any final decisions about the final disposition of his collection. I suggested Ohio State University, but I knew that they hadn't been the lucky recipients. I've been asking around for years now, trying to find out what exactly did happen to it, but no one seemed to have an inkling. My worst fear was that the whole collection ended up in a landfill, a fate that would have been a loss almost too horrible to bear. Finally an anonymous source has come forward to tell me that Steve Geppi, owner and president of Diamond Comic Distributors, now has the collection. It is reportedly all boxed up at his Geppi's Entertainment Museum, presumably someday to be used in the displays. No word on how exactly Geppi came to be the owner; whether Gordon or his heirs sold it to Geppi, or if it was a donation (highly doubtful, I think). I can't say I'm exactly happy about the new ownership. I would have much preferred to have it end up in a research facility rather than a ballpark pop culture attraction. It seems to be without any facilities or, apparently, interest in serving researchers (I note that the Educational Programs link is empty, for instance). On the other hand, it's better than a landfill. But it seems a little like having Neil Armstrong's spacesuit end up at an MTV museum if you know what I mean. I had originally planned to review Nancy Goldstein's fabulous book Jackie Ormes - The First African American Woman Cartoonist on the blog but instead I will be reviewing it for the next issue of Hogan's Alley. Given the publication schedule of HA and the speed at which books go out of print these days, I just wanted to give you folks a heads-up that you will definitely want to purchase a copy. It's a first rate piece of research, entertaining, and reproduces wonderful material that is about as rare as it comes. I know at least a few blog readers have access to Proquest, the digitized newspaper archives. If you do I'd like to ask you a favor. I'm currently in need of good quality comic strip reproductions from the Pittsburgh Courier and the microfilm is in terrible condition. I know that Proquest recently added the Courier to its list of digitized newspapers. The nearest facility to me that has the Courier from Proquest is about 120 miles away, and with the price of gas these days I'd rather not make that trip only to find out that the digitized version is no better than the microfilm. If you have access could you please do a little spot-check for me (I'm mostly interested in the 1930s-50s) and report back regarding the quality of the scans? Some Proquest material is stunningly good, others are so low resolution and pixilated that they're of no use for my purposes. Having gotten to know Gordon in his later years, I'm glad to see this. However, I'm curious at what exactly has turned up, as I know at least some of the originals from his collection were sold a few years ago in one of Russ Cochran's comic art auctions. Gordon's favorite part of his collection was the set of scrapbooks in which he was hoping to mount one published example of every comic strip ever created. He spent a lot of time in his retirement years trying to track down obscure titles he didn't have. This is what I'm hoping has turned up in the museum for people to view. 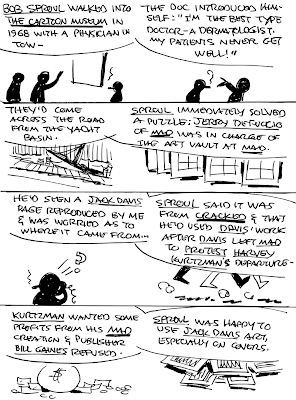 As for his many file cabinets full of collected strips and the attic full of unclipped newspaper pages, maybe those will spark the publishing by Diamond of some reprint collections that would otherwise have not found their way to market. He used to sell strips from this stock for "pocket money" after he retired, and I can't help but wonder if somewhere in the collection there's still a bunch of Batman strips in an envelope with my name written on the outside, which he had pulled together to sell to me before he became too ill to continue his hobby. As for how Geppi got the collection, I only know that the materials most likely went to a nephew who helped him a lot after his wife passed away, as the Campbells had no children. I do remember Gordon saying there were several who were interested in getting his collection as a donation, but that he was hoping the collection could bring a financial reward to him or his nephew. Unfortunately, it was several months after his death before I learned he had died, so I do not know the story of what happened to the collection, and of how parts of it got to Cochran and Geppi. Ah, now here we have the real goodies! 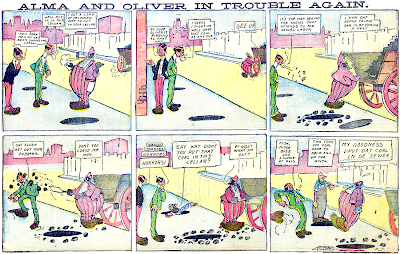 Alma & Oliver is by all reports George McManus' very first continuing comic strip. I've been looking for a sample of this strip for years now without any luck. Cole Johnson to the rescue! Though the strip is mentioned in practically every cartoon history ever written I was beginning to think it never actually existed, much like the oft-mentioned Swinnerton's "Little Bears and Tigers" which just turned out to be a misheard reference to Little Bears and Tykes. These same cartoon histories usually cite Alma & Oliver as running in 1900, but Cole informs me that this is definitely not the case. He cites running dates of September 28 1902 to April 12 1903. Swift-thinking blog readers will already realize that makes Alma & Oliver McManus' second strip -- Burglar Pete turns out to be his very first! At least 'tis so until Cole comes across with some other undocumented rarity! By the way, this strip is a great example of needing to see samples. I always assumed, and I think some histories may even indicate, that the titular Alma was a woman. Given McManus' minor fame in St. Louis for his Gibsonesque glamor girl drawings it seemed a reasonable assumption that his first strip would feature a pretty gal. Not so, not so! What are the dates of these Republic comics? Only one Gay Boys cartoon had one. Sorry but Cole didn't give me the specific dates on the samples. Cole, could you tell us the dates? Hello Allan, and Hello Furballs-I mean Furbils- The dates are---- Burglar Pete: 8-24-02, Gay Boys: "Rats" 9-7-02, "Love Feast" 3-8-03. Alma & Oliver:"Politicians" 11-16-02, "Trouble Again" 3-15-03. Cole Johnson. 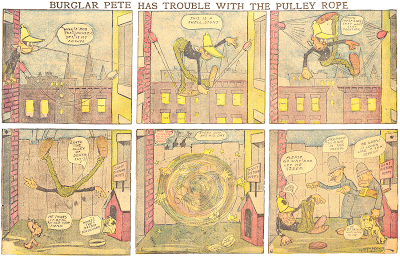 Here's Burglar Pete from Cole Johnson's St. Louis Republic archives. I'd never seen this one before; a George McManus production that lasted just three episodes. The third and final episode has Pete getting a new moniker -- Toothpick Pete. 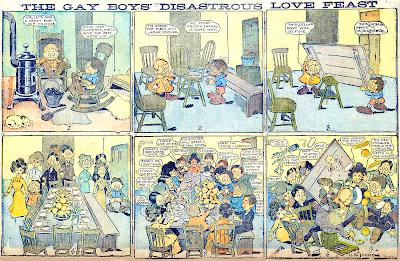 The strip ran on 8/17, 8/24 and 8/31 of 1902. Thanks for turning me on to this cartoon character, I'd never heard of him before. Hi Allan! Long time no hear! I was at the hospital for some month with a strange ailment, the Guillain Barré Syndrome (look to Wikipedia for the eerie details); anyway, now I'm well enough, back to home, to work and to write my comments to your wonderful blog. I think that neither Burglar Pete nor Alma and Oliver where the first McManus characters, At page 141 of "Here We Are Again" you 'ill find a McManus Sunday page of ***1900*** DEC 23 (to see it download a padf file of pages 129-192 of the book by copying and pasting the adress below). I erroneusly thought that the unnamed character were Alma and Oliver, not suspecting that the former was a man (Alma was my mother's name, and also in English Alma is a female name). Unless the couple is an early avatar for the 1902 series. In any case, note the husband's Jiggesque top-hat. Regarding your 1900 McManus piece, I'm afraid it's not part of a series as far as I can tell from my fragmentary index. The Republic generally seemed to favor one-shots and published tons of them in 1900-01. McManus started appearing in the Sunday section in 1900, as you say, but apparently never did a continuing series until Burglar Pete. The 12/23/00 strip certainly isn't part of the Alma & Oliver series. 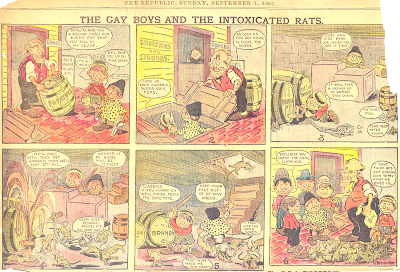 The Gay Boys was by H.F. Thode and ran in the St. Louis Republic from July 13 1902 through May 31 1903. The Republic at this time mostly ran McClure Syndicate material but usually reserved a page for in-house cartoonists. Thode got the lion's share of the limited room in these days, initially sharing space with a very young and raw George McManus. 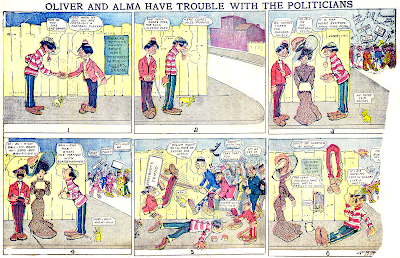 McManus left for New York during the run of this strip and thus it became the only continuing local feature in the Republic for the latter part of its tenure. Many thanks to Cole Johnson for these scans. The Republic is a paper of some fascination to me, especially because McManus got his start there. Unfortunately the microfilm of the Republic is missing many Sunday sections and my information on the newspaper's features has more holes than Swiss cheese. Cole has an impressive file of these sections and has consented to go through them for the benefit of myself and you blog readers. Expect to see more goodies from the Republic coming up soon! Ah, to visit the days when strange old men paid boys to go in the cellar and kill rats. Great stuff... thanks much to you and Mr. Johnson for posting them! I look forward to more comics of the lost Republic.